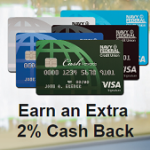 Discover just announced that cardholders can now earn a 5% cashback bonus on up to $300 in spending on groceries in May. This bonus can be earned in addition to the 5% categories (movie theaters and restaurants) that were previously announced for the current quarter. You’ll need to sign up for the promo first before you can start earning your bonus 5% cashback. You can sign up now at this link. This update is now also reflected on our cash back bonus calendar, where you’ll notice that the Chase Freedom is also offering 5% back this quarter on groceries (on up to $1500 in spending).